Chrissie Day is a textile artist who runs Teesdale Fibres. She has made it her mission to source local wool and her pedigree Teeswater and BFL yarns have been dyed by Yarn Garden , proving hugely popular at the wool shows this year. As well as finding time to run her wool production she is an author of craft books, teaches workshops – both online and in her studio at Farfield Mill in Sedbergh – and also creates designs and OOAK commissions in knit and also nuno felt. Earlier I posted an interview with dyer George about his experience of the wool, sourced by Chrissie, and his passion for dyeing. I also wanted to hear about the process from Chrissie’s side of the fence; how she sources the wool and why its so important that it is very local to her. 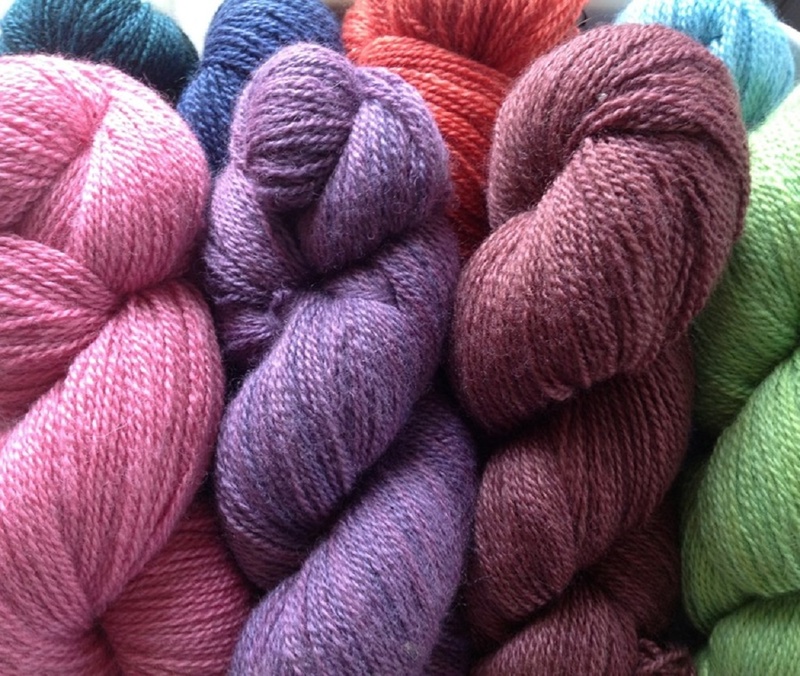 Chrissie, tell us about Teesdale Fibres and how you got started? My inspiration to start Teesdale Fibres happened when my husband and I bought a building to renovate in this area of outstanding natural beauty, high up in the North Pennines in the Upper Teesdale valley. A beautiful, friendly brown sheep – which I later learned to be Zwartble – caught my eye and after making enquiries discovered the farmer never used the fleece. We did a deal and the Zwartbles woollen spun was my 1st venture.It was well received and the following year I purchased in the valley some Shetland and some BFL – my secret recipe yarn, which is worsted spun from these two is my best seller. I was offered a prime flock fleece of BFL and soon after Teeswater, a rare breed sourced locally. These are my four core yarns which knit as 4 ply, although we plan to spin the Teeswater finer. What is important to you about the journey your wool takes? All the fleece must come from around me. Provenance is very, very important and also having one flock processed together [for the pedigree yarns] and not a mixture. The wool journey is again very important. I choose my fleeces and have them processed a commercial mill. I do feel we import far too much wool into a country that produces great fibre. I do the Natural dyeing myself and George, from Yarn Garden. dyes the rest for me.He also dyes and has sole selling rights on all the Teeswater. Yes, you approached George and Louise to dye your wool. What drew you to Yarn Garden? George has a natural flair for colour and the whole Yarn Garden stall drew me to them. We will certainly work together on next year’s colours for the yarn. The yarn is very limited and when it’s gone, it’s gone. Being such a small production do you try and attain the same breed yarns year on year, or do you like to work with other available resources? Yes. I never set out to be a yarn producer, so now I seem to be doing this I am staying with the four [breed] yarns I do. In terms of your textile design, what inspires you and what does it mean using your own yarns in your design? It is hard to pinpoint inspiration, but at the moment hub caps and old wrought iron gates fascinate me and I see knitted designs wherever I look at these! I feel very, very proud designing and knitting with a yarn I have initiated. I felt with both Zwartbles and BFL – Zwarbles sheep started this journey, so I have a soft spot for it and love the colour nuances in the brown, which changes from year to year – weather dependant up here at 1400 feet. The BFL is great on the needles and holds stitch pattern very well, but drapes beautifully too. Chrissie, thank you so much for talking to WOVEMBER. As your wool is very limited, where can Wovemberists get their hands on it? The BFL/Shetland and Zwartbles yarns are available in kits exclusive to Made in the Dales, There are skeins of North Pennines BFL, dyed in natural dyes, available in my shop and the Teeswater is available from Yarn Garden. Huge thanks to Chrissie for giving her time. I am currently knitting a project in her BFL, dyed with woad (Isatis Tinctora), and it is a very dreamy yarn indeed, even better to know it is from a pedigree flock, sourced by a real champion for wool.